Zverev apologised to Federer at the net. 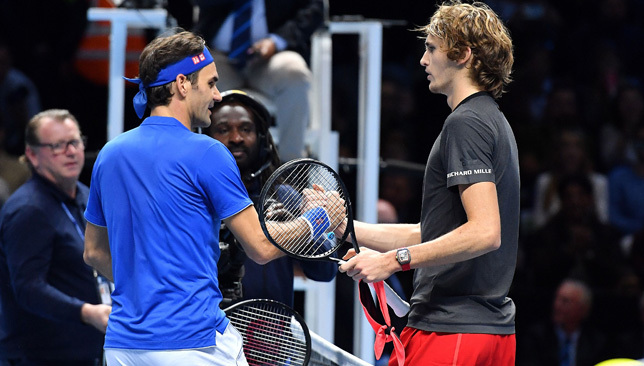 Alexander Zverev apologised to a booing crowd after he defeated Roger Federer and became the youngest player to reach the title match of the ATP Finals since Juan Martin del Potro in 2009. 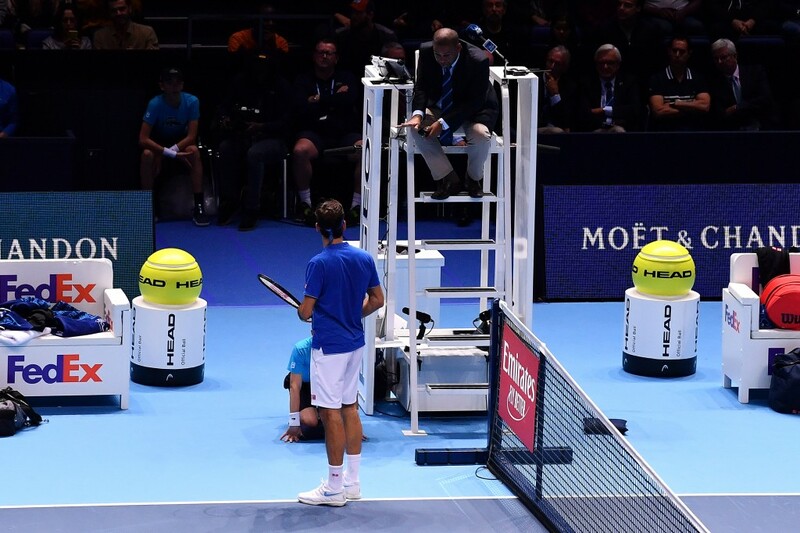 In what was later described by Federer as a “bold move”, Zverev stopped play during the eighth point of the second-set tiebreak because a ball kid standing behind the Swiss accidentally dropped a ball, which rolled onto the court for a few feet. Umpire Carlos Bernardes and Federer both didn’t see the incident occur but after Bernardes confirmed with the ball kid that he had indeed dropped the ball, the Brazilian decided they should replay the point. Federer had managed to return Zverev’s serve in the point that was interrupted. When the point was replayed, Zverev aced the Swiss on his way to a 7-5, 7-6(5) victory, denying Federer the chance to fight for a 100th career title. During his on-court interview with Annabel Croft, an apologetic Zverev tried to explain what happened to the booing O2 Arena crowd. “First of all I’d like to apologise for the situation in the tiebreak. The ball boy dropped the ball so it’s in the rules that we have to replay the point,” said the 21-year-old German. Croft addressed the crowd and told them Zverev was telling the truth, and that the booing was unwarranted. “I think you have to be a little bit more respectful,” said Croft. Zverev continued: “I apologised to Roger at the net already. He told me it’s okay and it’s obviously in the rules. I want to apologise to the crowd as well. Zverev admits he felt “sad” from the whole situation. “Obviously a lot of emotions going on through my head. I was really upset afterwards in the locker room, as well. I’m not going to lie. I had to take a few minutes for myself,” he said. Federer, whose last of six ATP Finals titles came in 2011, addressed the incident calmly during his press conference, in which he was asked if the situation affected him. “What do you mean, ‘it affected me?’ Of course it did. It got replayed. I got aced. So, yes, it did affect me,” said Federer. “I don’t know what’s rules are. I just think I was trying to think what would I have done in his position? It’s bold to stop the rally because I don’t know if it’s an umpire’s decision or not. While you’re hitting, that might go through your head. So I would have probably said, Whew, I’ll probably keep on playing, unless the ball really rolls into the court quick. “I don’t know what happened actually. Was it a bounce and it rolled, or a bounce and he picked it up? “It did roll, okay. Well, I mean, it’s a very difficult call. I didn’t see it. The umpire didn’t see it. But once the ball boy said that’s what happened, linesman confirmed, the umpire believes them, which is obviously true, what is there to be done? It’s normal to replay the point from that point on. Federer, who once upon a time was a ball boy himself at his home tournament in Basel, assures he is not upset with the boy who dropped the ball. “I just asked him, ‘Did you drop the ball?’ I didn’t understand what he said. I said, ‘Did you drop the ball?’ He said, ‘Yes, I did drop the ball’. Federer concedes that he didn’t play as well as he would have liked and said he struggled with Zverev’s first serve earlier in the match. The 37-year-old concludes his season with a 48-10 win-loss record and his quest for a 100th title will have to resume in 2019. Zverev is the first German to reach the title decider at the ATP Finals since Boris Becker in 1996. He is now 3-3 head-to-head against Federer and will be chasing the biggest trophy of his career on Sunday. “I think we’re eager to see what we’re going to work on exactly. Also what’s the decision on the clay, seeing what’s going to transpire through the vacation, what is my thoughts, all that, then taking the decision at some point in next few weeks on that,” said the 37-year-old. On the move: Karen Khachanov. 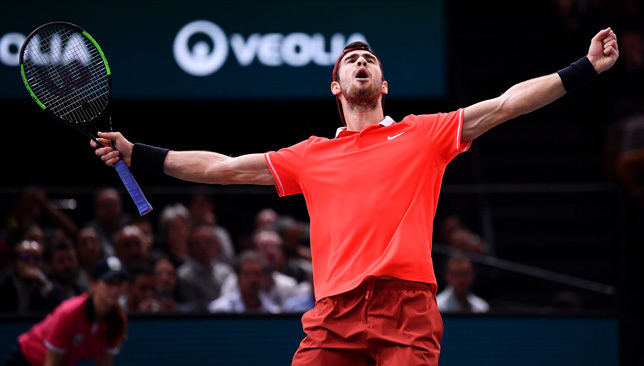 Four consecutive victories over top-10 players, including one over Novak Djokovic in the final, to clinch a maiden Masters 1000 crown has left Karen Khachanov on cloud nine and he admits he is just winding down from his dream finish to the season. The freshly-crowned Paris Masters champion, who was an alternate at this week’s ATP Finals, had been waiting for that one big result to consolidate his status as a young force to be reckoned with on tour and that result finally came in Paris-Bercy. “Emotionally of course a great moment, especially to finish the season like that, with these memories, with this level of game, the emotions of course are at the highest point,” said Khachanov in London, reflecting on his latest achievement. 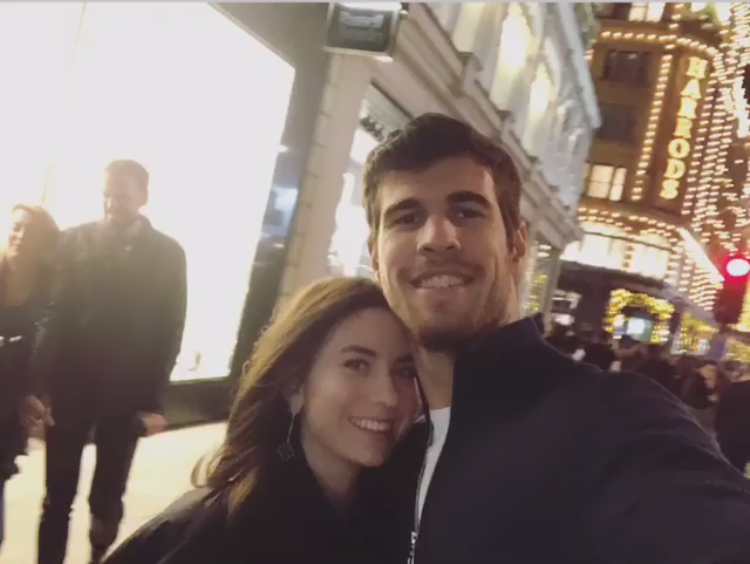 Being an alternate at the O2 in London doesn’t require much of a player but Khachanov has kept himself busy, hitting daily with the players contesting the ATP Finals, making sure he’d be ready if he was needed to replace anyone who got injured. His services were ultimately not needed and he can now go on holiday and celebrate his career-best season, with an extra $110,000 in the bank for being in London. Since the start of Wimbledon, only two players have managed to defeat Djokovic, in 36 matches contested by the Serb – Khachanov in Paris, and Stefanos Tsitsipas in Toronto. Before Paris, Khachanov was 1-10 win-loss against top-10 opposition in 2018. He had two titles under his belt though, captured in Marseille in February and Moscow last month, but it was actually his tight four-set defeat to Rafael Nadal in the US Open third round that proved to be a key turning point for the 22-year-old Russian. “To be the only player to beat Djokovic in the second part of the year [alongside Tsitsipas] of course – I said many times after the match with Rafa [in New York], I think it was disappointing for me to lose this match because I still had chances and I was playing at a really high level I think during the entire match and I wasn’t losing it, I was mentally there, physically there, and I said in the press conference, ‘I hope this match gives me a lot of experience and sooner or later it will turn on the other side and I will win these kind of matches against top guys’, so that’s basically what happened, I was really believing in that,” explained Khachanov. The higher you move up the tennis hierarchy, the slimmer the margins and it’s the little things that can make all the difference. For Khachanov, improving his record against top-10 players like he did in Paris all came down to mental toughness when it mattered the most. “At the end you can make the same amount of mistakes, like the top guys are doing, but not in the crucial moments. So that’s the most important thing. I had these couple of matches against the top guys where I think I made some mistakes in these crucial moments and these last few weeks I was playing really good in these specific moments, when it’s deuce, when it’s tight score, pressure is coming, that’s difference. So at the end I just won those points and the match went on my side,” said the Muscovite. Khachanov is among a group of talented young players currently making their move on the tour, many of which are Russian, or have Russian parents. Khachanov, Andrey Rublev and Daniil Medvedev are all Russian. Denis Shapovalov is Canadian, Stefanos Tsitsipas is Greek, Alexander Zverev is German, but they all have at least one parent who is Russian. “Okay they have Russian roots, they are not Russian,” notes Khachanov when asked if he can find an explanation behind this current wave of Russian talent. Does it help having many Russian speakers around on tour similar to his age? “Not much I think. At the end, still, we know each other pretty well but I’m not the greatest friends with Stefanos or Denis. My best friends are Andrey and Daniil Medvedev. But still we’re good. Even with Sascha[Zverev], I’m closer to him than to Stefanos and Denis because they’re a bit younger and maybe we didn’t play together in juniors, that’s maybe the main thing. But again, we are now more and more at the same tournaments on tour and we’re good together,” he says. At the end of last season, after competing in the inaugural Next Gen ATP Finals in Milan, Khachanov announced he was splitting with his coach of four years Galo Blanco. He then reunited with a former coach of his, Vedran Martic, who used to work with Goran Ivanisevic. At 198cm, and with a huge game that has carried him to No. 11 in the world, Khachanov cuts an imposing figure on the tennis court. He has picked up four career ATP titles so far and has reached the fourth round of a Grand Slam on three occasions. He has been married to wife Veronika since he was 19 and believes stability in his personal life has greatly helped his tennis. “Yes of course, absolutely. Okay maybe our story is a little bit special because we’ve known each other from a young age, really from eight years old and I feel like I’ve known my wife for 100 years, of course in a good way, and that’s the way I feel. You feel the support always on the side, she’s helping with a lot of things and always supporting me when she’s traveling with me and I’m thankful for that. I think the biggest part of my success belongs to her,” he gushes. Growing up, Khachanov admired Juan Martin del Potro and Marat Safin. He’s been compared to the latter as they both hail from Russia, trained in Spain, and have similar games, and it’s a comparison Khachanov doesn’t shy away from. “I like it of course. He was my favourite tennis player growing up. Of course it’s nice. I never try to imitate, I like to be myself, but on the other side, to be compared to him is a privilege. I like him also as a person, when we met with him five years ago, he’s a really cool guy. Still it’s a long way for me to achieve where he was and what he did,” he said of the two-time Grand Slam champion. Khachanov chuckles when a journalist asks him if he every thinks about becoming the first from the younger generation to win a major. “Of course not. I’m joking man, of course yes. What are you talking about, man, how can you ask this question?” he says with a laugh. While he maintains that he sets high standards for himself, he isn’t burdening himself with setting goals for next season just yet. “Still it’s too early to say what I expect. I expect to keep working the same way, just try to become a better person, better player, and to keep going my way, where are the goals and try to achieve. I don’t like to put specifically any brackets, I just like going smoothly the way I am and to enjoy and to keep working, of course that’s the main thing. Without hard work nothing pays off,” he concludes. Khachanov will warm up for the 2019 season by competing at the Mubadala World Tennis Championship in Abu Dhabi, where he joins Djokovic, Nadal, Kevin Anderson, Dominic Thiem and Chung Hyeon from December 27-29, 2018. Roger Federer believes it’s too soon to pass a verdict on the introduction of the new ATP Cup as well as the revamped Davis Cup but is pleased that team competitions are popping up on the tennis calendar. The Swiss, whose company Team8 launched another team event, the Laver Cup, last year, was speaking after booking himself a ticket to the semis of the ATP Finals, topping his group with a 6-4, 6-3 win over Kevin Anderson on Thursday. The ATP Cup was unveiled at the O2 Arena on Thursday, and will be staged in January 2020 across three Australian cities. The revamped Davis Cup will be held in Madrid in November 2019. Both events will follow a similar World Cup-like format. “Well, we haven’t seen the new Davis Cup yet. We haven’t seen a new World Team Cup yet, which used to exist in Dusseldorf, which now is in Australia,” said Federer, who is into the semis of the ATP Finals for the 15th time in 16 appearances. “I think we have to wait and see how it is. It’s so nice that we have so many highlights, so many tournaments to choose from. Clearly if the World Team Cup is going to be held, players will want to play that first week of the year, so you would think it’s going to be exciting. 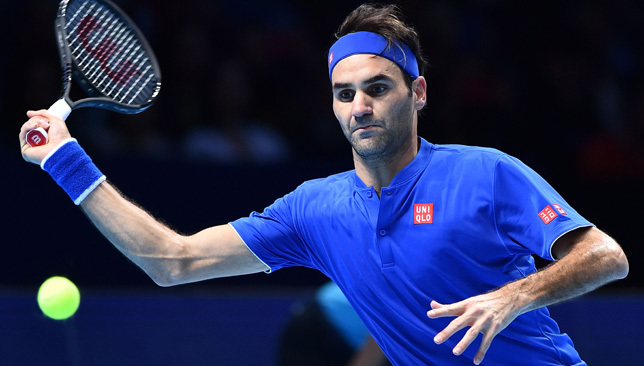 Federer referred to the IPTL, a team exhibition league that took place for three years before it folded for financial reasons, as an example of how successful and attractive team competitions can be. “If you make it in a team format, it can be fun. Players enjoy being with somebody else than just fighting for yourself. I see it in their eyes. I remember at the IPTL, talking to the women players, they were like, ‘Oh, my God, this is so much fun for three weeks. Be on a team, support one another on a team, practice with one another, be with one another’,” said the 37-year-old. “You forget how, I don’t want to say it’s lonely as a tennis player sometimes, but when you win sometimes like tonight, game, set, match, Federer, you fist pump, look at your team, I’m happy, but you’re on your own. “Team events, like Davis Cup, Hopman Cup, Laver Cup, you’re playing for somebody else, something else, a country, a region, whatever it may be. I think that makes the player quite happy and gives a different feel that it can actually also fuel you for other ATP events or other just tournaments. The ITF and ATP are at odds regarding their competing tournaments while players continue to complain about the length of the tennis season and how physically and mentally taxing it is. Djokovic said on Wednesday in London that the tour should focus more on quality rather than quantity when it comes to its structure and calendar, while 21-year-old Alexander Zverev reiterated his discontent at the length of the season. But not every player is taking the same stance as the German youngster. Austrian Dominic Thiem, known for playing heavy schedules, admits the offseason is short but is not complaining. “We have basically a never ending season, I would say. Now I will go one week holidays, then I spend few days at home, then… I think the most important period of the season is starting, the offseason, the only time where we have time to practice and to really improve all the stuff what we need to work for. That’s how it is in tennis,” said Thiem, who defeated Kei Nishikori on Thursday for his first win of the week but was eliminated from the ATP Finals as Federer and Anderson advanced from the group. Federer feels it is up to the player to pick and choose the tournaments and schedule they see fit and sees no harm in adding new events and giving players more options to compete if they want to. “As a team, player and team, you decide which are your priorities and how much can a body take, how much can a mind take, how much travel can someone endure,” said Federer, who hasn’t played the clay swing for the past two seasons. “The good thing is we as players are not employed by a club. I can walk right now out of the door and go onto vacation if I want to. Nobody is going to stop me. They won’t like it, but I can. That’s a massive privilege, I believe, that a tennis player has. I think we’ve done a nice job from a player standpoint to understand it’s not something we do, out of respect to the fans, the tournament organizers, the sponsors and so forth, and also just for the integrity of the game. “There’s two ways to look at it. One, it’s nice that there’s so many tournaments. When you get injured, not like skiing, you’re going to miss the entire season. Federer is now two wins away from a 100th career title, and a first ATP Finals trophy since 2011. He isn’t looking that far ahead just yet though as he waits to learn the identity of his semi-final opponent. “Personally I’m still not thinking of the number 100. I won’t let that get in my head, make me go crazy because it should be something I’m excited about and not something I should feel extra pressure. As long as I think Novak is in the draw anyhow, he’s playing so good again, it’s never going to be easy,” said Federer. Djokovic, who has already qualified for the semis, faces Marin Cilic on Friday night in the closing group stage match of the tournament, while John Isner takes on Zverev earlier in the day. Djokovic will qualify as top of the group in any scenario except if Cilic defeats him and Isner beats Zverev. If Djokovic tops his group, then he avoid a semi-final against Federer, and would take on Anderson in the last-four on Saturday.